When I logged on to my computer this morning, the first email I noticed in my inbox contained a link to a shocking video which I could only watch with utter disbelief and revulsion. It came from my Roman Catholic correspondent Beverly. This surprised me because I’d always thought Beverly was an exemplary Catholic who would be willing to die for her Pope. After all, the Pope is enveloped in an aura of numinous sanctity, and according to hundreds of millions of pious Catholics, is believed to be infallible. My first reaction to this video, as I say, was entirely negative. It still is. Angry rants by young men full of sound and fury and the froth of surplus testosterone have scant appeal for me. Much of what this young scoundrel had to say, however, seemed to make a lot of sense to me, even though his manner of saying it was decidedly off-putting. Fortunately, I had a second video at hand which was more appealing and made precisely the same points in a nicer, more gentlemanly way. So I tag on this second video in order to soften the effects of the ill-mannered stridency of the first offering. Don’t trust the Pope. 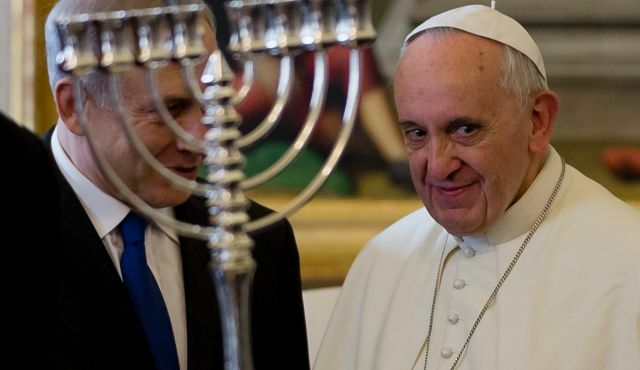 He is either an infiltrator and secret agent of the Jews or maybe he is a even a crypto-Jew doing his best to transform the Church into a branch of the Synagogue. Here are a few hard facts you need to consider carefully. Only a couple of weeks ago, the Pope won the prestigious Charlemagne Prize for 2016. If that doesn’t start alarm bells ringing for you, nothing will. The Charlemagne Prize is also known as the Coudenhove Kalergi Prize. The first recipient of the Charlemagne Prize (in 1950) was the sinister Count Richard von Coudenhove Kalergi. Half Austrian and half Japanese, this mongrelized nobleman was a passionate philosemite who believed that the Jews were the spiritual elite of the world, the intellectual crème de la crème — in short, the Chosen People in every sense. In addition, he viewed the White European race with loathing and not without a tinge of envy, being only half-white himself. 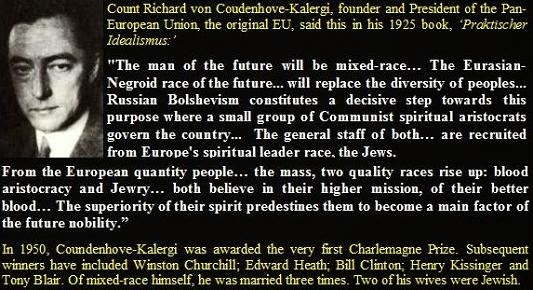 Like many of the Jews he so admired—Lenin and Trotsky were two of his favorites—Count Kalergi saw the White race as “the cancer of human history“, a race that needed to be bred out of existence by forced interbreeding with the darker races of Africa and Asia. He envisaged a future in which every European would look like an Ancient Egyptian and there were no white people left anywhere, most of them having disappeared into a muddy-complexioned and mongrelized mass. In his book Practical Idealism, Kalergi indicates that the residents of the future “United States of Europe” will not be the People of the Old Continent, but a kind of sub-humans, products of miscegenation. He clearly states that the peoples of Europe should interbreed with Asians and colored races, thus creating something akin to a multinational herd of livestock with no quality and easily controlled by [an essentially Jewish] ruling elite. The only way to ensure this is for the governing elite to have complete control of who has children with whom. Kalergi proclaims the elimination of nations with the use of ethnic separatist movements and mass migration. In order for Europe to be controlled by an elite, he wants to turn people into one homogeneous mixed breed of Blacks, Whites and Asians. “The man of the future will be of mixed race. The races and classes of today will gradually disappear due to the elimination of space, time, and prejudice. The Eurasian-negroid race of the future, similar in appearance to the Ancient Egyptians, will replace the diversity of peoples and the diversity of individuals. Although no textbook mentions Count Kalergi, his ideas are the guiding principles of the European Union. The belief that the peoples of Europe should be mixed with Africans and Asians, to destroy our identity and create a single mestizo race, is the basis of all community policies that aim to protect minorities. This is not done for humanitarian reasons, but because of the directives issued by the ruthless [European] regime with its machinations for the greatest genocide in history: White genocide. The Coudenhove-Kalergi European Prize (known also as the Charlemagne Prize) is awarded nearly every year to Europeans who have excelled in promoting this plan of ever further “integration”. Among those awarded with such a prize are Angela Merkel and Herman Van Rompuy. LD: The prize is now mostly awarded every year. Europe will need, by 2025, 159,000,000 migrants. If we look around us, the Coudenhove Kalergi plan seems to be in full flow. Every single recipient of the Charlemagne Prize, from Count Coudenhove Kalergi in 1950 to Pope Francis in 2016, has been on the payroll of the Jews and has plugged multiculturalism and mass immigration with a view to the eventual disappearance of the White race into a mongrelized mass. Who did his best in Britain to throw open the floodgates to endless hordes of migrants from the Third World? Answer: Tony Blair. Who did exactly the same thing in Germany a few years later? Answer: Angela Merkel. Both Blair and Merkel have been rewarded for their contributions to multiculturalism and the ongoing mongrelization of the White race. The Coudenhove Callergi Prize was awarded to Blair in 1999 and to Merkel in 2008. Both Blair and Merkel are race traitors—and Blair, in addition, is a war criminal. And now that it’s 2016 we must welcome the latest winner of the Coudenhove Kallergi Prize—a prize inseparable from the promotion of multiculturalism, mass immigration, and the slow and systematic genocide of the White race.